When will these old, tired, and myopic Igbo elders give way and allow the young generation to restore Biafra nation, which they failed to achieve because of saboteur? If we fail this time, all of us including them and their families will be enslaved and Islamized in Nigeria. Nigeria is an Islamic country period! They control your crude oil running in your backyard and kill you with impunity whenever they want – even without provocation. 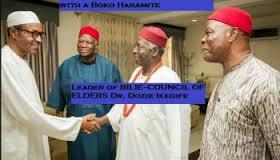 Igbo men – please wake-up from your slumber and greed.